We went for dinner to The Handmade Burger Company this week. It’s a chain store which sells – no prizes for guessing what – burgers! 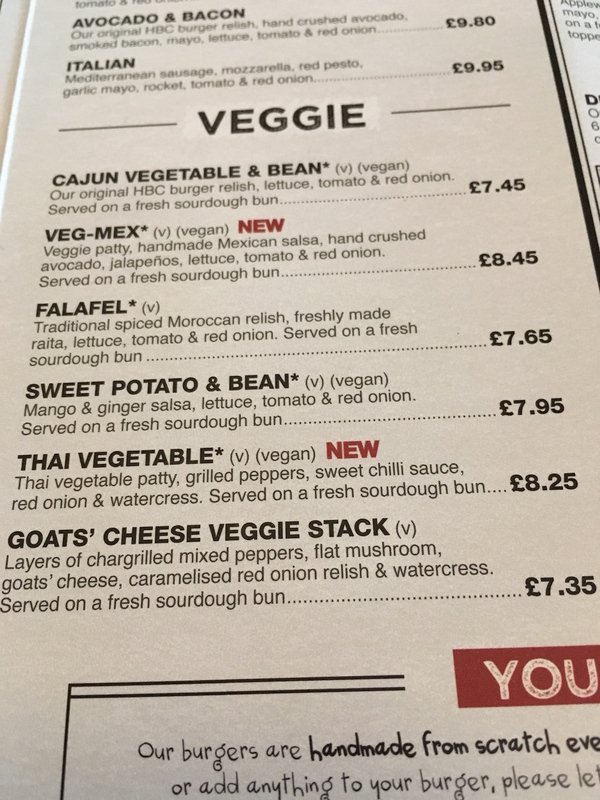 I nearly fell off my chair and had a heart attack when I saw the menu because there were six vegetarian options and four of them vegan. Usually there’s just one thing for me to eat when we go out which I don’t particularly mind because it avoids decision fatigue. I didn’t know what to do with myself? Four choices! They all looked delicious. How could I possibly choose? The decision was too difficult so we decided to go home and cook instead. Just kidding! I ordered the Thai Vegetable and it tasted just as good as it sounds. Posted in Journal, Vegan and tagged Aberdeen, burgers, Handmade Burger Company, restaurant, Vegan, vegetarian. Bookmark the permalink. I did! It was really good. And yes, I’m sure we’ll go again so I can try the other options. Wow, your burger looks incredible. Wish this chain was available in the states. Enjoy! Vegan / Vegetarian is not our thing, but I’m glad you enjoyed it. Thank you! It was very good. We’ll definitely go back. My general experience in such places is that it’s best not to watch what else may be getting cooked on the same grill as your vegan fare. I’m sure you’re right but it doesn’t bother me all that much. If I was vegan for health reasons and had heart disease then it would bother me. However it’s enough to know that I’m not supporting or contributing to that cruelty. I generally agree, but as a 99.9% pure vegan I try to avoid making too many small exceptions, even if they’re passive ones. The B12 reference reminds me to ask: Do you try to get your B12 via diet choices or do you take supplements? I do the latter, mainly because I don’t want to have to think that hard about what I’m eating. The soy milk I drink has B12 so I don’t take supplements. Whenever I have my iron levels checked I get them to check B12 also and it’s always really high. We used to go there all the time, but stopped after we had bad service a few times. Need to try it again as there’s a few more things on the menu since we last tried it! We had a similar experience. We used to go more frequently a few years ago but after a bad service experience didn’t go again until last week. The service was good last week so maybe they’ve changed?